Mark Grotjahn’s large new paintings abound with torrents of ropy impasto, laid down in thickets, cascading waves, and bundles that swell, braid around, or overlap one another. Noses and mouths appear in kaleidoscopic furrows. Eyes, too—sometimes in clusters, other times alone. Often these eyes are gouged out, opaque, blank, like those of some simian being or blind oracle. There are echoes of Cubism here and Vlaminck’s Fauvism, of mid-century abstraction, German and neo-Expressionism, rock painting, folk art, and fabric design. I’m tantalized by the facture and physicality of these paintings. What Grotjahn (pronounced groat-john) paints doesn’t stay put on these variegated surfaces; instead, it shifts around the involuting centerless space. You can discern the ways in which this work is made, yet no formal system appears. (I surmise that the artist himself is sometimes caught off guard by what he’s produced.) His strangely shamanic art gives me a remnant of the pow I get from those ancient eternal faces in Picasso’s Les Demoiselles d’Avignon. The winding rows of oil paint have been carefully laid on, wet-on-wet. Sometimes these lines look like colored grubs or raffia, in tones that are rich and saturated, ranging from mauve and apple to emerald and blood red. I think of magic carpets and magnetic fields. I spy networks of Martian canals and landscapes folding over themselves. I glimpse one of painting’s oldest purposes: the uncanny ability to conjure beings and invoke spirits. I also take pleasure in the so-called negative power in Grotjahn’s work. That is, I love his paintings for what they are not. Unlike much art of the past decade, Grotjahn isn’t simply working from a prescribed checklist of academically acceptable, curator-approved isms and twists. His palette isn’t only the voguish trio black, white, and silver; images aren’t taken mechanically from newspapers, the Internet, or other media; his paintings aren’t comments about comments about Warhol; they’re not coolly ironic. These qualities don’t inherently make Grotjahn’s art brave or even good (although it is good). They make you realize just how locked-in and unsurprising so much market-driven work has become. Happening upon his paintings is a wild surprise; you’re reminded of the pleasures of the open, the out-there, and the untamed. It is the best show by a mid-career painter that I’ve seen in a long time. Mark Grotjahn’s new paintings are harsh, elegant things that enthrall the eye and splinter the mind. They emphasize painting as a psychic and bodily process fueled in part by the devouring and digesting of previous art to formulate a new synthesis. In particular, these large, vertical cardboard-on-canvas works appear to feast on the painting and sculpture of early Modernism, when abstraction and representation were not seen as mutually exclusive. Possessing a torrential force, they are not so much covered with thatches of thrashing, tensile lines as bursting with them, as with live, barely controlled wires. On first sight, they might almost be large, colorful drawings made by slashing the surfaces in long, full-bodied strokes of crayon or chalk that have some of the directness of Pollock’s drips. But the surfaces are also dense and tactile; as you approach they slow down. Up close, the lines are heavily textured, stuttering and multicolored, the result of a fairly careful palette-knife technique reminiscent of the French midcentury painter Jean-Paul Riopelle but without the unctuous flamboyance. Mr. Grotjahn, who lives and works in Los Angeles, has long used schematic faces as the starting point for his abstract paintings, obliterating their features as he develops the generally symmetrical butterfly-wing geometries for which he is known. Here rawness rather than finish prevails. The radiating, ricocheting lines never submit; the flaring planes never emerge. The faces hold their own, if just barely, to affirm in staunchly contemporary terms the human presence behind all art. Mark Grotjahn’s large new paintings abound with torrents of ropy impasto, laid down in thickets, cascading waves, and bundles that swell, braid around, or overlap one another. Noses and mouths appear in kaleidoscopic furrows. Eyes, too — sometimes in clusters, other times alone. Often these eyes are gouged out, opaque, blank, like those of some simian being or blind oracle. There are echoes of Cubism here and Maurice de Vlaminck’s Fauvism, of mid-century abstraction, German and neo-Expressionism, rock painting, folk art and fabric design. I’m tantalized by the facture and physicality of these paintings. What Grotjahn paints doesn’t stay put on these variegated surfaces; instead, it shifts around the involuting centerless space. You can discern the ways in which this work is made, yet no formal system appears. (I surmise that the artist himself is sometimes caught off guard by what he’s produced.) His strangely shamanic art gives me a remnant of the pow I get from those ancient eternal faces in Picasso’s Les Demoiselles d’Avignon. I also take pleasure in the so-called negative power in Grotjahn’s work. That is, I love his paintings for what they are not. Unlike much art of the past decade, Grotjahn isn’t simply working from a prescribed checklist of academically acceptable, curator-approved isms and twists. His palette isn’t only the voguish trio black, white, and silver; images aren’t taken mechanically from newspapers, the Internet or other media; his paintings aren’t comments about comments about Warhol; they’re not coolly ironic. These qualities don’t inherently make Grotjahn’s art brave or even good (although it is good). They make you realize just how locked-in and unsurprising so much market-driven work has become. Happening upon his paintings is a wild surprise; you’re reminded of the pleasures of the open, the out-there, and the untamed. It is the best show by a mid-career painter that I’ve seen in a long time. Mark Grotjahn, Untitled (Green Eyes and Orange Cream Mask M6/7.f), 2012. Painted bronze, 27 3/4 x 10 3/8 x 16 1/2 inches. © Mark Grotjahn. Courtesy Gagosian Gallery. Photography by Robert McKeever. NEW YORK, NY.- Gagosian Gallery is presenting Mark Grotjahn’s first exhibition of painted bronze sculptures. Grotjahn’s Mask sculptures are deceptive. Cast in bronze from spontaneous cardboard assemblages that he has been working on privately for over a decade, they record all the nuances of the original found material with its corrugations, dents, tears, and creases. Each original cardboard form—taller, deeper, flatter, or roughly cut away—spawns up to eight bronze casts, produced according to the lost-mold casting method. (In some instances, Grotjahn has even retained the channels that transport the molten metal into the slip, transforming them into powerful formal elements). The bronzes are vigorously painted, often with the fingers, in a riotous spectrum of color—deep violet with green accents, puce, scarlet, emerald, turquoise, scumbles of pastel shades, sober or fiery tones. While many of them are expressively and compellingly rendered in abstract terms, other seem primarily to be supports for the fact of Grotjahn’s authorship, their surfaces covered by his erratically blocked signature or initials. Most of them rest on pedestals, stubbornly sculptural, while a few are wall-mounted, referring directly to painting. Specifically, they speak to Grotjahn’s contrasting bodies of work, the Face and the Butterfly paintings—the former with their elaborate textures and primitive style, their savage quality underscored by the cardboard on which they are painted; the latter with their densely layered and nuanced monochromes. The Mask sculptures recall the simple cardboard box constructions typical of early classroom activity— emulated so charmingly by Picasso for his own children during the idyllic Mediterranean years—flat, square faces with holes for eyes, a tube for nose, and a slightly larger hole or slash for a mouth. Sometimes the face is given just one of the three facial features. Replaying the inspirative relationship between the early Modernists and the arts of Africa and Oceania, they also explore the obsession with surface initiated by the Tachists and Abstract Expressionists. Like his predecessors, Grotjahn establishes an aesthetic remove from his referents via the processes of fabrication and production, thus his sculptures manifest both an undeniable primal intensity and a sophisticated yet endearing appeal. 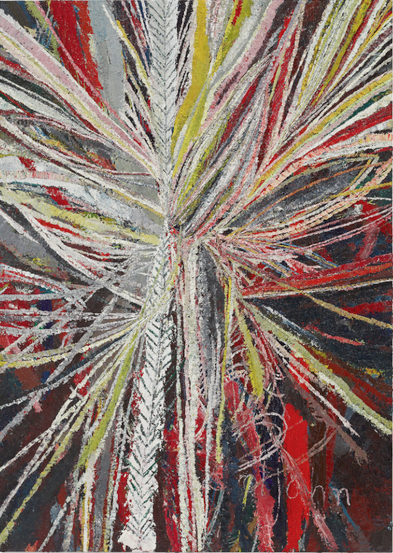 L.A.-based artist Mark Grotjahn has become widely renowned over the past decade for his “Butterfly” paintings. In this ongoing series, Renaissance perspectival techniques are used to create symmetrically composed radial patterns, with two or more vanishing points. Often containing subtle variations on a single pantone-derived color (like hot fuchsia, dusky indigo, ivory white), and painted with great precision, these works radiate order and composure. As such, they seem like glamorous updates on a particularly austere strain of geometric abstraction, a legacy that runs from Malevich to Reinhardt to LeWitt. It was quite a surprise, then, to encounter Grotjahn’s new exhibition at Shane Campbell Gallery last month, “Three to Five Faces.” Here, the Apollonian reserve of his previous works is supplanted with feral, Dionysian energy, resulting in a show that’s as pleasurable as it is unexpected. Each of the five large, vertically-formatted paintings (oil on cardboard, mounted on canvas) is a dense polychromatic skein, comprised of thick, rope-like lines of paint that have been applied with a palette knife. Each line is a uniform hue — primary colors abound, along with greens, grays and whites — and most stretch or curve diagonally across the picture plane, forming tense, dynamic compositions. Embedded within these impastoed tangles are sets of shapes that suggest the basic schematics of a face: almond-shaped eyes, cartoon noses, spherical nostrils (strangely, none of these paintings depict any mouths). But these visages have nothing to do with human likeness. Instead, they suggest zoomorphized masks, ironically recalling early modernism’s fascination with the “primitive,” particularly, the work of Picasso, Nolde, and Roualt. As implied by the exhibition’s title, most of these paintings contain more than one visage; eyes and noses overlap and jostle for attention, resulting in facial features as abstract as the grounds in which they’re submerged. For example, Untitled (Hidden Tea, Face 41.30) contains multiple outlines of blank orbs and elongated proboscides, rendered in ashen whites and lemon yellows, over a mottled ground of alizarin crimson and muted phathlo blue. Although all the energy is directed towards the center of the picture, there is no resting point; as soon as you start to decipher one form, you’re immediately drawn to another. And another. The effect is kaleidoscopic and dizzying. Untitled (Broken Down Beautiful Post Impressionist Face 41.71) is more structured, but no less wild. The upper half contains a group of leering eyes – in this case, with eyeballs – stacked on top of one another, while the lower half is a smattering of snouts. Only one painting, Untitled (Nagel Cover Face 41.62), could be considered remotely “representational,” in that it only depicts a single face. Overall, this work suggests some strange, simian-like beast, furtively peering through a candy-colored thicket. As intriguing as these paintings are as pictures, their true subject seems to be the alchemical nature of the stuff from which they’re made. In reproduction they might look matte and dry — almost as though they’re mere collages made with colored pipe cleaners — but in the “flesh,” they’re imposing and viscous, with an undeniable visceral charge. And surprisingly, these heavily worked surfaces still invoke deep recessional space, an effect that recalls the abstract fields of Pollock, Tobey and Riopelle. Grotjahn spent years refining his “Butterfly” paintings, and it’ll be interesting to see if he does the same with this series of works. Already, he’s set a wildly exciting precedent. These “Face” paintings demonstrate a deft conflation of form, content and materiality that results in a deeply immersive viewing experience. Once you’ve encountered the strange, primordial power of these works, it’s hard to step away. A view of the exhibition “Othoniel.” Nine new sculptures by French artist Jean-Michel Othoniel are shown at L&M Arts. “Untitled (Black and Purple Knot)” by Jean-Michel Othoniel. The work is on view at L&M Arts through Oct. 6. “Red Fan” by Kazuo Shiraga at Hauser & Wirth gallery. The work is on view in “A Visual Essay on Gutai” through Oct. 27. The opening of Mark Grotjahn’s latest show attracted collectors such as hedge-fund manager Steve Cohen and Donald B. Marron of Lightyear Capital LLC. What they saw at Gagosian Gallery’s Madison Avenue headquarters resembles cardboard boxes, crudely cut up and splattered with paint to look like masks with protruding, Pinocchio-like noses. The low-end appearance is deceiving. Displayed on pedestals, the pieces are actually cast in bronze. The daubs turn them into a hybrid of sculpture and painting, a direction the Los Angeles-based artist explored in his 2011 “Face” series. Some of those semi-abstract paintings were so densely layered with oil paint, the viscous material actually projected about an inch off the canvas. Humorous and just a tad menacing, the bronzes remain true to the rough physicality of the original cardboards, down to the smallest dents, tears and creases. The works are unique. Prices range from about $100,000 to $250,000. 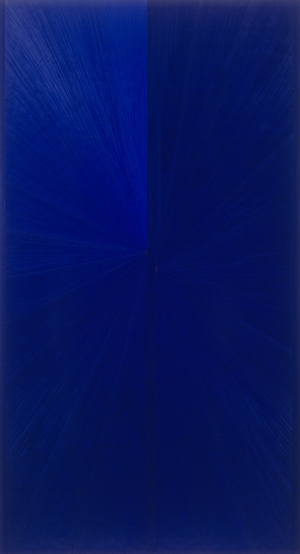 “Mark Grotjahn” runs through Oct. 27 at 980 Madison Ave.; +1-212-744-2313; http://www.gagosian.com/. 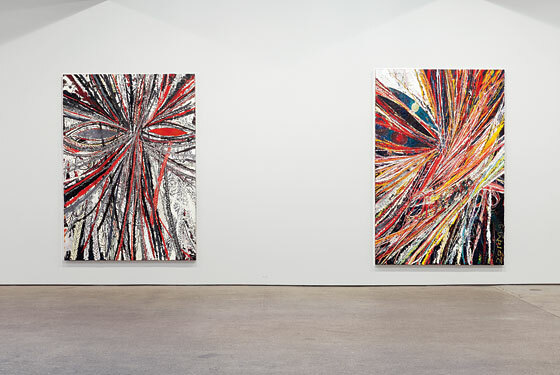 The career of LA artist Mark Grotjahn has taken off in spectacular way over the last few years. His exceptional works but also to his unconventional behavior keep surprising the art world. MGR: The gallery that we opened was not exactly a commercial space. At that time there were only a few galleries in LA that would give a solo show to a young artist. So, for a young artist, the only possibility would be a big group show. We thought we had a better eye than other galleries and we decided to organize straight up solo shows. We have always thought that we were artists in the first place so we created a beautiful space in which the artists could do the show and the public could see what artists were capable of doing, not just showing one or two small objects. MG: Why did you want to become an artist at all? MGR: When I was 15 my art teacher showed me the book Concerning the Spiritual in Art by Kandinsky, in which I found an answer to what I was doing. It opened my eyes to the fact that the designs and drawings I was making could be considered art. In a way, this is the moment when a certain kind of my art education started. So from reading Kandinsky I went to Paul Klee, then to Schnabel and Baselitz. MGJ: No, not always the painters. I went to Richard Prince and Mike Kelley as well. MG: So always a very strong visual appearance. MGJ: Yes. Although I also really like the dry conceptual works like those from Adrian Piper. MG: One of your first well-known projects was a conceptual work – the Sign Exchange program that you started at school in Berkeley and in San Francisco and continued while running the gallery. MGJ: I started it as a reactionary work. When I was in Berkeley, everybody was doing figurative work; barely any of my colleagues knew who Mike Kelley was. I was really bored with the work I was doing so I decided to give up painting the figure and started looking at people using painting and drawing but communicating effectively through these media. This drove me to the Sign Exchange program: people would paint a hotdog for a restaurant sign, or a picture of beer or hamburger because that was what they were selling. So I started to copy this work and tried to exchange my replicas with the “original” works. MG: What was the reason for this exchange? MGJ: When I started the project I thought that they were better than mine because they were communicating with their audience. I wanted their audience so I started to trade the signs in order to get their audience. MG: Didn’t the restaurant owners think you were crazy? MGR: In 90 percent of the cases when I tried to trade signs I was successful. Some of them thought I was weird, some of them thought I was funny. Sometimes they just wanted to get my sign and get me out of there as quickly as possible. Sometimes the owner would let me go to the back of the store and I would get to see where they kept their guns and money. MG: Then you brought the ‘real objects’ to the gallery and you showed them as objets trouvé, like your art works. MGR: I considered them as my art, although they were not found objects but traded objects. MG: Was it a kind of exploration what makes art art? MGR: I intellectually believed that art can be whatever you wanted it to be, but only by doing something does the idea become true. It is one thing to say you know something mentally but it is another thing to actually know it, physically. It is one thing to say I believe art can be like this and another thing to do it and know it. MG: So you did it. MGR: I did. I moved out here, opened the gallery, worked with different artists and took care of my conceptual needs in terms of working outside of myself, being with other people, like being in a band. Artists love to work and they love to talk about their work. It is great. Those were different kinds of human connections. At a certain moment, I started to look at why I got into art in the first place, why I was interested in art. Then I thought about line and color and then I started to make abstracts. MG: Did you start to produce different paintings and drawings? MGR: I was actually looking for one or two motif to exploit. I think because the Sign Exchange was a conceptual work I was always coming up with different ideas. I wanted to pick one idea and stick with it. See what I could do with one motif. MG: So while doing abstract paintings and drawings you were looking for motifs that you could use as a structure. MG: This was the second part of the 90s and that means an extremely difficult time for painting; there was a clear anti-painting attitude constructed by many art theoreticians and art historians. Doing painting in the second part of the 90s was not so obvious. MGR: That is partially true, especially regarding the handmade works where you could see the artist’s hand. At that time, I was also thinking about Gauguin, which was a very romantic notion of the artist. So again, it was a kind of reaction to what was going on in LA at that time. MG: You were playing with the romantic notion of the artist and with the historically-oriented media and then you discovered that the mathematical perspective could be an option for a structure in your work. Did you realize that by doing that, you would immediately connect your works with art history? MGR: While I was making the three-tier perspectives I was thinking of Kandinsky, Mondrian, etc. I thought I was doing non-objective work. I no longer see it like that in retrospect. I knew that the history of non-representational painting is already more than 100 years old and I knew that I’m part of that language. But it is like playing in a rock n’ roll band and asking: are you aware that you are part of the history of rock n’ roll? MG: Still, using perspective is perhaps more than that, because the introduction of perspective was an extremely important moment in art history when painting became taken seriously since there were scientific methods applied to it. MGR: I have never thought about my works in this way. I really like to have my cake and eat it too. Yes, I call them perspectives but I never saw of them as perspectives; I saw them really as non-objective. When I look at them, of course, they do look like roads or landscapes but I never thought of them in these terms when I was doing them. That came from other people and I think it makes sense they saw them in those terms especically considering the fact that I did call them perspectives. It was naïve of me not to have not seen them in their relationship to the scientific, the Renaissance, etc., but I just didn’t. MG: What about the multiple vanishing points? Was it to experiment with optical effects? MGR: It was strictly a formal device that I found interesting. That doesn’t mean that I didn’t find it interesting because of my knowledge of art history; I never thought of it specifically as an idea. MG: Did you intend to make your works more controlled and less emotional by using these geometrical and mathematical devices? MGR: Mondrian is geometrical and still highly emotional. When I went onto the ‘Faces’ I used different marks that are, I think, traditionally seen as expressive. The perspectives were very meditative and this is a different kind of emotion. There was a certain kind of peace and a certain kind of beauty that I was going for. I don’t think they are less expressive; it is just that the other ones, the ‘Faces,’ are viewed as more expressive. MG: Speaking of contemplative and beauty, let’s go to the motif of the butterfly, which at some point arrived in your work. MGR: The butterfly came because I tried to make some horizontal three-tier perspectives; the majority of my work is vertically orientated so I tried to work outside of that and make a painting with a horizontal orientation. I made the first two tiers vertical and I pointed the perspectives towards each other. As soon as I did that, and applied the color, it became a non-objective painting again. I got out of landscape. It certainly became more a painting and less a representation. MG: Did you call it a butterfly yourself? MGR: I called it a butterfly but it is just a way to categorize it as a group of works. MG: When you read articles about this category, many art critics connect the butterfly motif with nature. Did you make this connection yourself as well? MGR: It was not exactly what I was thinking about. I called some paintings perspectives but I’m not interested in perspective; I called some butterflies but I don’t think they are butterflies; I call my sculptures masks but they are not masks. MG: You play with us. MGR: I guess I play with words. MG: There seems to be plenty of opposition in your works. You just mentioned one: contemplative versus expressive. Could we go further to say rational versus emotional, chance versus conscious decision, abstract versus figurative? Do you need them? MGR: I don’t know whether I need them. Maybe somehow it is important for me to have structures to keep myself interested in making a work. MG: Do you create the tension yourself? MGR: It happens; I don’t consciously create it. I see it running through the work. It might be that I need the opposition in my work. I just consciously choose to work in different styles. When I moved here, nobody was signing their works because it was the cliché of the artist taking all the credit for the work, putting their ego in front. All of the work that was being shown in the hip and cool galleries in LA was conceptual work and nobody was signing their work. It was another cliché or an unwritten rule that I wanted to challenge. MG: This is why you enlarged your signature on the canvas. MGR: Yes, I put it in front and center. I wanted to say: stop thinking that as an artist you don’t have an ego and you don’t have a signature style. I wanted to challenge that: Actually, I am an artist, I have something to say, clearly I have an ego, I have the need to put this work in a gallery, and I want it to be seen. I definitely do. MG: So you were not extremely popular among the conceptual artists. MGR: No, I’m still not. MG: How do you work? How long does it take to finish a painting, for instance a butterfly painting? MGR: About three weeks, working 17 days straight. I couldn’t stop because otherwise the paint would start to change in consistency. But I haven’t made one since 2008; it’s been a while. MG: I read that you injured your shoulder a couple of years ago and this is the reason you cannot make them any longer. MGR: While skiing, I hit some ice and I went down. There was no choice in the matter so I went down. I didn’t see a doctor for two weeks until my wife told me that I should see one. He said that there was something wrong and my arm turned out to be broken. I couldn’t paint two hours straight, let along ten straight. I moved to the ‘Faces.’ This is something I could paint, I could look at, and step back from. Untitled (SII Some of us didn’t know we were Indian, 2011 MG: You don’t have any assistants? MGR: I do have assistants, but my assistants don’t touch my paintings once a painting has started. MG: Were you sad that you were forced to stop the butterfly paintings? MGR: I don’t know whether I was sad. I knew that I had to stop for a while and that I might go back to it when my arm recovered. I just never did. MG: Your recent exhibitions were with bronze sculpture which you called masks – interesting and provoking works. Again there were many comments on the dialogue with early modernism or folk art. You had always made them out of cardboard, so it was a special decision to make them in bronze. I also read that you considered them very personal, not for public consumption. Why did you decide to show them anyway? MGR: I kept them private for 13, 14 years. I gave them away to friends or occasionally traded one. At a certain moment, I wanted to do a show with them. When you cast them in bronze they become different. In a way, I depersonalized them; they feel less as a diary and are more an armature for a painting. MG: Let’s now talk a bit about the place you work and live, Los Angeles. Los Angeles is now considered as a very important artistic hub. Is this true for you? Is there a sense of an artistic community? MGR: There are many galleries and many new spaces that I haven’t had the chance to visit yet. MG: Are you so extremely busy with your own work that you don’t have time to visit other shows? MGR: I’ve been into making my own work and not spending a lot of time looking at other galleries. I work five, six, sometimes seven days a week. You can see in the butterfly works that they are very obsessive. I am a compulsive person. When I’m not making my work I feel that I’m wasting my life. MG: What makes you so popular among collectors nowadays? If you speak with American collectors, many of them admire you. MGR: It is true. I guess I am popular. There are many peoples who would like to have my work. I don’t know what it is that I’m doing. For a long time I wasn’t like this. MG: You really don’t know why Mark Grotjahn is considered the artist? MGR: Am I the artist? I would like to be that, it sounds good to me. MG: You have been part of the Gagosian gallery since 2007. Were you surprised when they asked you to join? MGR: No, it was like a two-year process. I had three galleries already – Anton Kern, Blum & Poe and Shane Campbell. MG: Many artists complain about the pressure of huge production for the market. Once you are with top galleries you are more or less obliged to produce many art works for the market. Do you mind? MGR: I like to be rich. It is easier to be rich than to be poor. 100 percent. It is easier to have too many people wanting your work than to have nobody wanting your work. It is hard to be an artist no matter what, but it is harder to be a poor artist than to be a rich artist. MG: But don’t you mind the pressure of delivering all the time works of a very good quality? MGR: I don’t have to produce a lot. It is up to me. Since all my work is really handmade I don’t really produce that much; I wish I produced more. I wish that I was like Jackson Pollock and I could make a few paintings per day. He was a genius. But unfortunately I’m not that good so it takes me three to four weeks to make a good work. MG: He had to hurry up, he died very early. MGR: He died at 44, my age. I would like to produce a lot, but it is not the way I work. I try not to put out paintings that are not good. Here in the studio, sometimes I think they are great but then I try to look at them for at least six months before I release them. I’m pretty good at that. MG: How interesting. Do you rework them sometimes? MGR: Sometimes, but I just like to keep them around, at least three or four months to know whether they are good enough. In my mind, they might be good but I’m not always the best judge. If my work goes out and is not good that’s my fault, not the market’s fault. MG: How many paintings are you producing per year? MGR: 10 to 15 per year. Van Gogh did 800 the last ten years of his life. MG: I can imagine that you like the idea that your paintings have become so expensive? MGR: Yeah… All my high school girlfriends think they shouldn’t have broken up with me. MG: How did it feel when you recently heard that one of your paintings was sold for $4 million at an auction? MGR: I watched it live online, and it got me high. I have personally never sold a work for that much. So this guy made more money on one of my paintings than I have ever made on one of my paintings. .
MG: In the end, this auction was also a kind of advertisement for you. 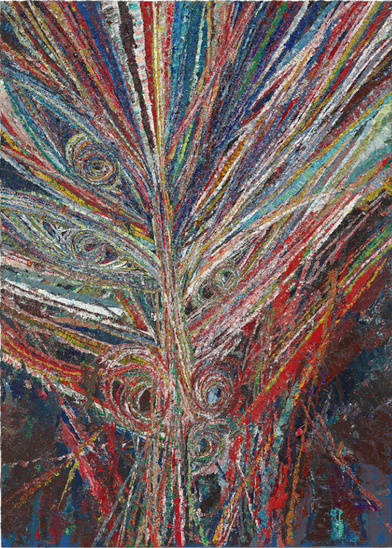 Everybody knows that Mark Grotjahn is now worth $4 million. MGR: I grew up looking at Picasso books, they seemed like magic to me. I want artists to own buildings; I want them to have financial power. MG: Of course, there were great artists in history who were rich and very much involved in making money for themselves. What do you think about the role of the collectors nowadays? If I get you right they shouldn’t make more money with your paintings than you. MGR: It is okay. I guess it is what I signed up for. I’m just sometimes disappointed that someone sells my work and he is one of the collectors who used to put an arm around me and say, ‘I will never sell your work, not even for five million dollars, never.’ And then they don’t want me to come over for Christmas because my painting is no longer on the wall because they sold it without telling me. MG: Did it happen often to you? MGR: Yes, it happened enough times to me that it is not shocking any longer. MG: The idea of money must be comforting when you are making your paintings. When you work, do you sometimes think about the fact that the object you are creating can become so valuable and expensive? MGR: I don’t let the fact that I sell my paintings get in the way of trying to make the best painting possible. I don’t take phone calls from my dealers when I’m working. I don’t want them to get into my head. So I have ways to protect myself against that and from it coming into my studio. But occasionally, I have to talk with my bookkeeper about the insurance on works. MG: It must be interesting. But it is not only about being able to work. It’ s also about the very nature of the works. Your paintings are often connected with the idea of transcendence and spirituality; you said yourself that art started for you after reading Kandinsky’s “Spirituality in Art”. MGR: When I was a teenager I believed that you could connect to this universal language. I don’t believe that any more, I believe that there is a language that you learn and that you can understand. Of course, I would like my paintings to be transformative; I would love my paintings to make someone happy to be alive. MG: Do you think that your personality – you know what you want, you are provocative, playful, intelligent – is important in positioning your work in the market? MGR: A few years ago a friend of my overheard my dealers talking to some collectors, they were telling them that I have narcolepsy, that I like to gamble, that I go to strip clubs, and of course they were using that as a marketing tool. Probably still are. The culture of the artist is extremely interesting. I love biographies of artists. MG: From what you said about being an artist, I think that you like to cultivate the romantic idea of the artist, to break the rules, to be an outsider, to provoke and challenge assumptions. MGR: At the same time, to be very traditional. I have two beautiful girls, I have a wife, a house. But I am an artist. It is a weird thing to be one. You come to work and you do this. This is a choice but it is a strange life. MG: You chose to be involved in a court case against one of your collectors. Did you enjoy it? MGR: Enjoy it! I hated it, it was terrible. MG: It was unprecedented, what you did as an artist. MGR: I’m in a position that I can afford to hire a lawyer to fight someone who doesn’t want to pay royalties. I didn’t enjoy doing it, but I felt like I didn’t have a choice. MG: Did you want to set an example on behalf of other artists as well? MGR: I did it for myself but I think it was important to do it. MG: Are you part of the private life of many collectors? MGR: I try not to be anymore. Because once you go skiing with them, all of a sudden they expect a painting from you for the price of a lift ticket. MG: Do you consider yourself as an American artist? MGR: I’m American although my father was born in Germany; I’m a first-generation American. MG: Now I understand your name! I thought it was more Dutch. MGR: All Germans are saying it is Dutch but it is German; it definitely traces back to Prussian roots. But I have never met any German who would give me the credit of having a German name. The maiden name of my grandmother was Gross, which is definitely German. MG: It must be amazing what has happened to you the last 10 years. Mark Grotjahn, an artist best known for his laborious and intricate paintings, is something of a hoarder. Anyone who visits his Los Angeles studio comes back gushing about the strange cardboard masks that litter the space. He started making them 10 years ago, around the time he began the series of abstract paintings that launched his career: his so-called butterfly series, which consist of detailed rays of color bursting from various vanishing points. He would only paint the butterflies in natural light, so he worked in 12-hour bursts, but when the sun went down, he wanted to keep going. He started saving cardboard boxes—including the 12-packs left over from his wedding—and toilet paper rolls, fashioning them into masks with vaguely phallic noses (the toilet paper rolls) and eerily blank, jack-o’-lantern expressions. They are both primal and juvenile; a lot of artists have made masks, Mr. Grotjahn says, but, he hastens to add, so have a lot of kids. Last week, Mr. Grotjahn, 44, was on the sixth floor of the Gagosian Gallery’s labyrinthine Madison Avenue location, presiding over a small army of art handlers that included the artist Dan Colen. The latter was taking a break from installing his own show downstairs—a secret one on the walls of Gagosian director Andy Avini’s office, consisting of crookedly hung works on paper that spelled out the word “GOD” (“they’ll be straight when I’m finished,” Mr. Colen said). The upstairs gallery was filled with painted bronze sculptures that were based on Mr. Grotjahn’s masks. They looked like they were smiling at their maker, mockingly. The masks may have been lying around his studio for a while, but the work on display was a new direction for the restless artist, who has been nearly universally praised for his paintings. He looked stressed out. In the last two years, he’s sued one of his early champions—a collector and trustee at L.A. MOCA—in a controversial case over resale royalties that was eventually settled out of court; he’s passed out drunk on a lawn during an AIDS charity auction in Dallas where one of his paintings sold for $1 million; he’s been the subject of museum and gallery shows in New York, Los Angeles, Chicago, Portland and Aspen. But his sculpture has rarely been seen outside of his studio, and the Gagosian solo show, his third with the gallery, would open the next day. I’d been told earlier that whether or not Mr. Grotjahn would speak to me “depends on how he’s feeling.” The installation had been going on for the better part of six days, and Mr. Grotjahn was still rearranging his works obsessively, trying out every conceivable display. When I arrived, the masks had been marshaled into two parallel rows, and were staring at the entrance to the gallery in a way that felt more menacing than welcoming. “I can’t tell if the frontality is kind of pushing people aside,” Mr. Grotjahn announced to no one in particular, and asked for the works to be moved again, then started edging his way toward me. Mr. Grotjahn started out as a gallerist. Born in Pasadena, he moved to Los Angeles after graduate school and opened a gallery with his old classmate Brent Peterson called Room 702, on Melrose and Heliotrope. The idea was to only do solo shows so people could “see what the artists could do.” Despite an invitation to move into the 6150 complex on Wilshire—which already housed places like ACME and Marc Foxx and would soon become the backbone of L.A.’s nascent gallery scene—Room 702 closed after less than two years, and Mr. Grotjahn became a full-time artist. The so-called “performance work” was the basis of a lot of what was to come. He’d go into a Safeway and take boxes and coffee cans and make sculptures in the aisles of the store, take pictures of people’s responses to the work, and then put everything back where it was. He’d paint exact replicas of storefront signs—mostly liquor and convenience stores—then get the store’s owner to exchange the copy for the real thing. It was a kind of secret that only the artist was in on; people would interact with his work without realizing it. But the precision that went into making those signs would eventually be put to use in the butterfly series, which required a great deal of patience. They were also physically taxing. Since injuring his shoulder a few years ago, Mr. Grotjahn hasn’t been able to make them. 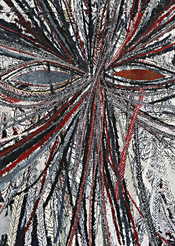 This turned out to be less hindrance than liberation: he focused more on his freeform face paintings—the only requirement is that they have eyes and a mouth, and everything that grows out of that is more extemporaneous—and put together an exhibition last year for Anton Kern Gallery, his longtime New York representative, that earned him more than one sincere comparison by critics to another painter, Pablo Picasso. By this time, the sculptures in the upstairs gallery had all been rearranged on separate pedestals. He was slumped in a chair, looking gloomily into the room, inquiring gravely of whomever was standing closest to him, “What do you think?” People were telling him to go to lunch, give the work some space, then come back and see what he thought. He decided he’d “eat some food, drink some wine, have a cappuccino, be a nice little gentleman on the Upper East Side,” but by the time I was getting ready to leave, he was still sitting. Julian Schnabel may be one of America’s most famous living painters. But in a strange but appropriate twist for a man whose body of work now spans five decades, his paintings are less instantly identifiable—they elude the instant iconic familiarity that turned many of his contemporaries rising in the ’70s and ’80s into visual brand names. This paradox may be explained by Schnabel’s overwhelming success as a film director, helming such cinematic masterpieces as Before Night Falls (2000) and The Diving Bell and the Butterfly (2007), ever since he broke into movie-making with Basquiat, his 1996 biopic of his late friend, the artist Jean-Michel Basquiat. (In fact, Schnabel, along with his studio assistant Greg Bogin painted the works used in Basquiat to showcase the young artist’s feral spirit). Triumph in cinema is seemingly always destined to eclipse development in the more rarefied circles of visual art. But the public’s inexperience with the breadth of Schnabel’s art productions is also due to the 62-year-old, Brooklyn-born artist’s ingrained painting strategy: He simply refuses to keep making one kind of work, or operate in one style, by splitting open the same vein until it runs dry. Ever since he created his early Wax Paintings series, starting in 1975, Schnabel’s range of materials and modes of construction have been so varied that it seems as if no fixed surface is safe from his application: There are velvet paintings, oil paintings, paintings on wallpaper, on mirror, on tarp, incorporations of photography, incorporations of found objects (literally found on the road or in water), a graffiti-esque stroke, a spill, a stain, and in his Hurricane Bob series he used his car to drag a tarp behind him on the road so the asphalt would leave a burning mark on the fabric, and then left the tarp exposed to Hurricane Bob in 1991. Perhaps most famous are his Plate Paintings series of smashed crockery that he procured from thrift stores and concretized on canvas as abstract destruction sites or in the form of vulnerable portraits. Schnabel is an artist as equally obsessed with time—how all of these disparate elements come into union provisionally but eternally on one plane—as he is with exploring the possibilities of a how a mark can be left as a trace. With expected bravado, Schnabel follows the en plein air technique of painting; a lot of his work is made in his outdoor studio in Montauk, a roofless room that allows him to see color and shape in their natural light. In a sense, it could be argued that all of his works are landscapes of one variety or another. MARK GROTJAHN: Hi, Julian. Where are you? JULIAN SCHNABEL: I’m in Copenhagen, in Hotel d’Angleterre, with May, the baby, and the nurse. I’m having a show in Frederikssund with Francis Picabia and a guy named [J.F.] Willumsen—who would have had his 150th birthday on Saturday, except he’s dead. GROTJAHN: How old would Picabia be? SCHNABEL: Picabia was born in 1879 and died in 1953. And the other guy was born in 1863. GROTJAHN: When were you born? SCHNABEL: I was born in 1951. The whole weird concept of this show is that this guy Willumsen is being redefined by work that came after him. He knew Gauguin in Brittany, he painted a lot in Venice, and he donated his collections to this museum. It’s a really odd and interesting show about hybrid painting—it’s about the imperfect. GROTJAHN: I’d like to see it. SCHNABEL: I guess I’m the only artist who’s alive in the show. GROTJAHN: You had your first show in New York with Mary Boone in ’79. And then you had another one right after it that same year, correct? SCHNABEL: Exactly. One was in February and one was in October. GROTJAHN: Did you prefer one show over the other? SCHNABEL: Well, I wanted to show the plate paintings that I had made in 1978. When I made them, I was excited. I think when Mary saw those paintings, she felt they were kind of terrifying or scary to deal with. I mean, she thought they were good but they seemed kind of radical, and she thought it would be better to show the wax paintings I was working on first and save the plate-painting show for later. Actually, I thought the show was going to happen much later, but a guy named Paul Mogensen dropped out for some reason that month, and all of a sudden I had the show in February. SCHNABEL: There’s always somebody applying for the job. GROTJAHN: Yeah, I hear you. So how did those two shows work out? SCHNABEL: I showed four wax paintings in the first show and I was happy with that. But, you know, when you’re young, you’re anxious to show things—you want to show the last thing you did. In the second show, I showed four plate paintings and one wax painting. It’s funny because Mary had this small gallery in the same building as Leo Castelli and Ileana Sonnabend. It was a clever thing that she did, even if her gallery was the size of a closet compared to theirs, because she’d be in the same building, 420 West Broadway, where everybody would walk up the stairs and invariably see what was in her gallery. They were already there to see what was in Leo’s gallery or Ileana’s. [Gallerist] Annina Nosei was the person who ended up buying my first plate painting. SCHNABEL: The Patients and the Doctors . I think she bought it for, like, $3,500. I think I got $1,700 of it. Something in there—I’m off $200 one way or the other. GROTJAHN: That might have paid for something back then. Through Jan. 7Some younger painters seem to be countering the strictures of late Modernism by revisiting the early Modernist cusp between abstraction and representation, an area that includes Mondrian’s flower paintings, Jawlensky’s masks and Malevich’s robotlike peasants, where the figurative, the geometric, the spatial and the visionary still remain tangled. There they seek paths not taken, tangents not explored. 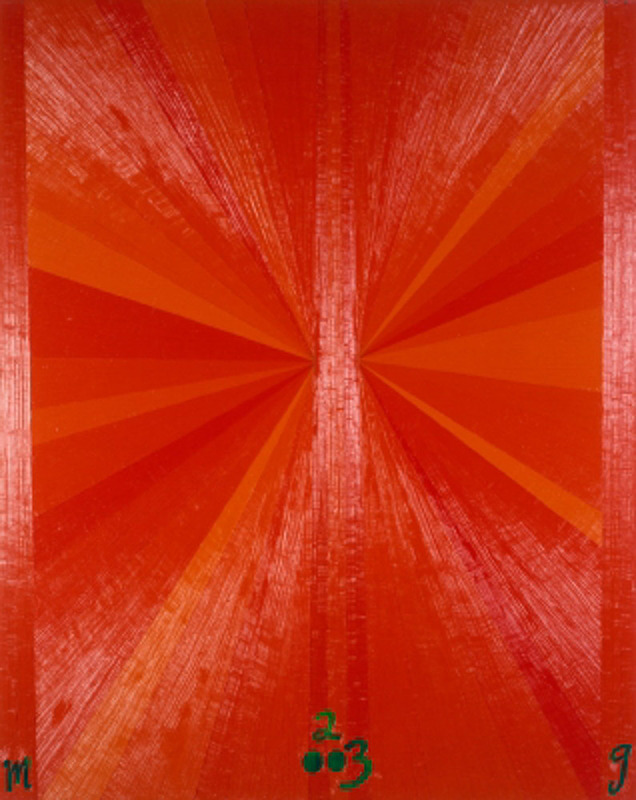 That their searches have not been in vain is evidenced by work as varied as that of Tomma Abts, Wade Guyton, Eileen Quinlan, Sergei Jensen, Cheyney Thompson and a host of others, including the Los Angeles painter Mark Grotjahn.Mr. Grotjahn, who is 38, makes slightly obstreperous paintings of faces and flowers, as well as the thick-surfaced pinwheel abstractions for which is he becoming best known. In these, closely related colors radiate out from a central vertical band, creating a straight-edged butterfly effect that is destabilized by the use of two or more vanishing points. Together these elements can create the sensation of a distant light exploding at the center of the image even if the painting is largely monochromatic. Two such works got a bit lost in the shuffle at last spring’s Whitney Biennial, but now Mr. Grotjahn has filled the museum’s ground floor gallery with 8 brash door-size color pencil drawings from a series of 13. Some stick to the monochrome, as in several nocturnal black-on-black works full of shadowy contrasts. Others that fan outward in clattery Op Art black-white contrasts have more bark and bite, including one where this tonal combination softens to a visionary buzz. Elsewhere black is contrasted with spokes of red, orange and brown, or the fiery colors take over completely. Untitled (Multi-Red 4 Wings White Background), 2006. Color pencil on paper; 180 x 121 cm. pencil on paper; 165 x 121 cm. 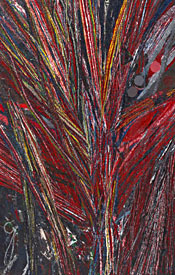 M. Grotjahn 03), 2003. Oil on linen, 175 x 137 cm. MG: Not always. When you look at the “Flowers” and the “Faces,” would you know that they were personal? Would you know that they were based on pictures originally drawn by my grandfather who was a psychiatrist? I don’t think that this information is readily available. I guess it is out there. It comes out in interviews like this, or if you talk to the gallerist, you can get it that way. But, in terms of the actual exhibition, I’m not sure how much this information really matters.JT: But it is, at least, implied… You brought up perspectivalism, which is traditionally understood as a systematic means of situating the subject with respect to the object of vision. When you forcibly warp that system, like you do in your most recent suite of drawings which is up right now at the Whitney Museum in New York, that has direct psychological repercussions. So, again, I wonder: If everything is possible, but if you don’t want to do everything, like Richter does, then what do you do? It sounds like you’re saying that what you do is what you’ve always done, which takes us back to your earliest experiences and your earliest happiness in art-making. MG: I don’t know if it’s that I’m ambivalent. I believe there are relationships; it’s just that I’m not sure how concerned I am with being able to verbally exact them. There was a time when I really believed that if you were going to put out work in the public, as a responsible artist you should really know exactly what it is that you’re doing and be able to speak about it. Well, I definitely don’t think that you have to. Let’s just leave it at that.Jan Tumlir is an art critic based in Los Angeles. 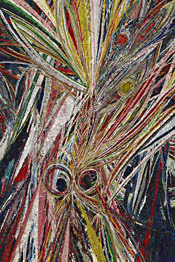 Mark Grotjahn was born in Pasadena, CA, in 1968. He lives and works in Los Angeles. 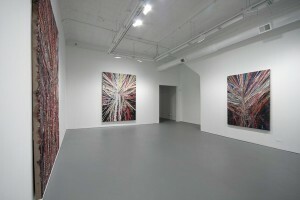 Selected solo shows: 2007: Anton Kern, New York. 2006: Whitney Museum, New York. 2005: Blum & Poe, Los Angeles; Stephen Friedman, London; UCLA Hammer Museum, Los Angeles. 2003: Anton Kern, New York. 2002:Blum & Poe, Santa Monica. Work/New Acquisitions,” MoMA, New York; “Painting in Tongues,” MOCA, Los Angeles; Whitney Biennial, New York. 2005: “The Painted World,” P.S.1, New York; “Drawing from the Modern,” MoMA, New York; 2004:54th Carnegie International, Pittsburgh.